Bankruptcy is often considered the most practical solution when no other means will allow a debtor to settle pressing financial obligations. Many people find that filing for a Chapter 7 or Chapter 13 bankruptcy action provides the opportunity to get a fresh start. If additional financial trouble ensues in the years to come, the debtor may or may not be able to file again. Here is what everyone should know about current bankruptcy laws and how they relate to additional filings. Chapter 7 bankruptcies typically take several months to complete. Once the discharge is granted by the court, the debtor is free to move forward without most of the debts included in the filing (certain debts are not subject to discharge). To file a subsequent chapter 7 bankruptcy, it’s necessary to wait until eight years from the filing date of the first bankruptcy. This means if that first Chapter 7 was filed on September 1, 2016, the debtor would be able to file a second Chapter 7 action beginning September 1, 2024. The current laws for filing a Chapter 13 bankruptcy after previously filing a Chapter 7 are a little different. Before petitioning the court, four years must have passed from the date of the previous chapter 7 petition. For example, a person who filed a Chapter 7 on September 1, 2016 and received a discharge a few months later would be eligible to file for a Chapter 13 bankruptcy any time after September 1, 2020. Chapter 13 bankruptcies allow debtors to repay all or most of their debt over a period of three to five years. Should the need arise to seek a Chapter 7 bankruptcy after the Chapter 13 is discharged, the debtor must wait until six years from the Chapter 7 filing date have passed. This means if the Chapter 13 was filed on August 1, 2016 and the action is discharged three years later, the debtor is eligible to file a Chapter 7 beginning on August 1, 2022. Should the need arise to file for Chapter 13 bankruptcy protection again, that second action may occur in as little as two years from the filing date on the previous Chapter 13. Along with the two-year requirement, the previous Chapter 13 must be discharged by the court prior to the second filing. In other words, a debtor who files a Chapter 13 bankruptcy on December 1, 2016 and receives a discharge in 2018 would be eligible to file a second Chapter 13 action on December 1, 2018. Choosing to file for any type of personal bankruptcy is a serious matter. Contact a bankruptcy attorney and seek counsel about the current debt load and whether either form of bankruptcy would be the best solution. The attorney can provide additional information about the specific requirements required by the local court of jurisdiction and ensure the client has all the information needed to make an informed decision. 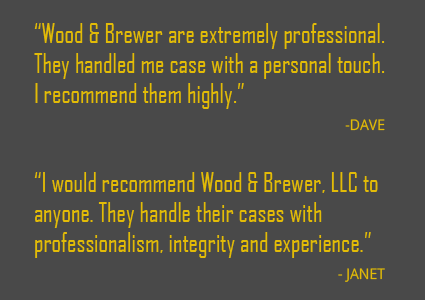 If you find yourself in a situation where you are questioning whether filing bankruptcy is a possibility for you, please do not hesitate to contact our attorneys at Wood & Brewer, LLC. We offer a free consultation because we know how stressful it can be, and we are here to help.